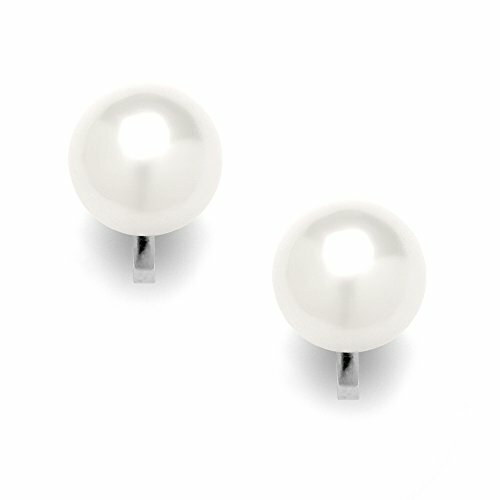 Mariell Genuine Shell Pearl Ivory Stud Clip-On Earrings - Glass Based with Mother of Pearl Finish (9mm) by Mariell at Lamont Design. MPN: 4515EC-I. Hurry! Limited time offer. Offer valid only while supplies last. Mariell's clip-on Light Ivory pearl stud earrings boast the opalescent luster of luxurious Genuine cultured pearls at a fraction of the price. Mariell's clip-on Light Ivory pearl stud earrings boast the opalescent luster of luxurious Genuine cultured pearls at a fraction of the price. Beautifully crafted with organic mother of pearl oyster shell, our Cream colored glass-based pearl clip earrings offer timeless elegance in a classic silhouette. These 9mm pearlescent stunners are a must-have for every jewelry collection. Whether paired with a wedding gown, cocktail dress or everyday wardrobe, these top-selling clip earrings offer a fabulous look with day-into-night comfort. Finally, the perfect pearl earrings for women with non-pierced ears. Genuine Platinum Rhodium setting with comfort back cushions. Lifetime Guaranteed. We promise you'll love these sophisticated stunners or your money-back. Treat yourself or someone you love to the luxury of classic pearls!